Last February, Apple issued its first Green Bond, a $1.5 billion vehicle for investors seeking to put their capital to work on projects that will reduce the global human impact on climate change, help develop technology products using safer materials and work to conserve scarce resources. The company has now reported on a series of projects financed by those bonds last year. Like Apple's other bond offerings issued in the U.S. and across other markets globally, the Green Bonds are a way to borrow money from investors seeking to limit their investment risk by accepting paper issued by a reputable company. They differ in that the Green Bond offering is committed to allocating funds for use in environmental projects. By borrowing money in the form of a bond, Apple can gain access to capital without repatriating its funds held overseas, avoiding a high tax it otherwise isn't required to pay. Bonds also enable the company to write off the interest it pays to bond holders. Across Apple's 2016 fiscal year that ended last September, the company reported having allocated an initial $441.5 million of Green Bond funds across 16 major projects. 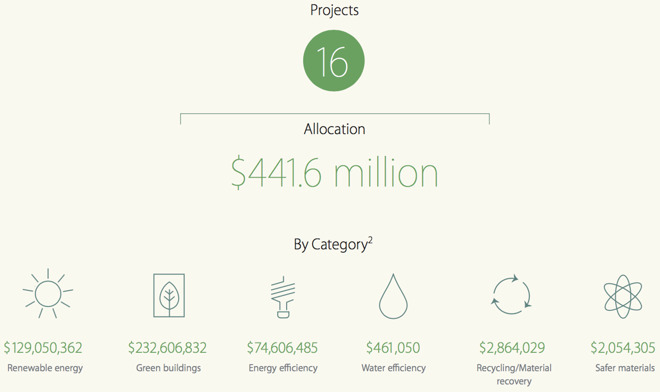 Those projects are projected to result in 127 megawatts of new renewable energy production; savings of more than 20 million gallons of water; diversion of 6,670 metric tons of waste from landfills; and the annual elimination of 191,500 metric tons of carbon dioxide emissions. 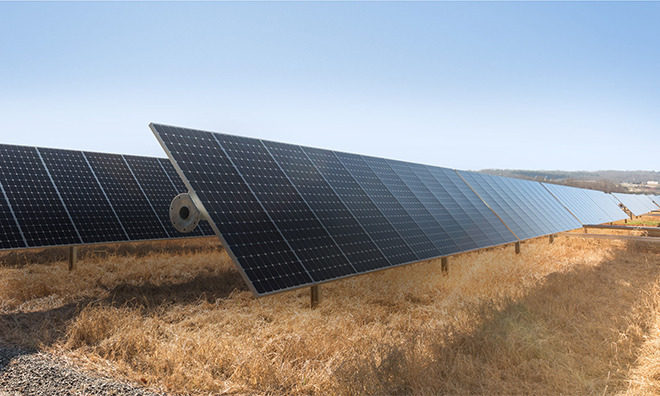 Apple partnered with Sustainalytics for an independent review of its projects to ensure that they met the standards of "Green Bond Principles" established by financial institutions including BlackRock and JPMorgan Chase. Green Bond Principles were intended to define key metrics of transparency in how funds are invested. The investment of Apple's Green Bond proceeds is also audited by Ernst & Young. Apple's first issue of $1.5 billion in Green Bonds last year was the largest ever for a U.S. company. Toyota has issued $3 billion of similar bonds since 2014, using the funds raised to fund leases and loans of its fuel efficient cars and hybrid vehicles. Lisa Jackson, Apple's vice president of environment, policy and social initiatives, told Reuters last year that the company decided to issue its green bond after the UN Climate Summit in Paris in December 2015, where hundreds of firms committed to fight climate change. One of the first projects funded by Green Bonds last year was profiled by Apple last year: Liam the precision robotic recycler. Liam is actually a line of robots currently operating in Californian and the Netherlands, with the capacity to disassemble 1.2 million old iPhones per year to recover high-quality components for material recycling. Consumer electronics are commonly shredded by recyclers, but this only results in the recovery of a limited number of lower-quality materials. With its specialized, precise robotic disassembly and sorting of parts, Liam is able to recover 419 pounds (190kg) of aluminum, 176 pounds (80kg) of copper, 12.13 pounds (5.5kg) of tin, 1.54 pounds (0.7kg) of silver, 4.48 ounces of gold (0.13kg), 1.4 ounces (0.04kg) of platinum, and 5.3 pounds (2.4kg) of other rare earth elements from every 10,000 iPhones it takes apart. In addition to the recovered value--that much gold, alone, is worth about $5,500--the recovery of cobalt and lithium from old batteries means less demand for these materials that must otherwise be sourced from a supply chain frequently tainted by human rights violations, including child labor. Apple already leads the industry in identifying and removing hazardous materials from its products. Going beyond legally mandated toxics, Apple developed its own Regulated Substances Specification, which details the company's global restrictions on the use of specific chemicals and materials in Apple products, accessories, manufacturing processes and packaging used for shipping. Green Bond funded the most recent doubling of the Environmental Testing Lab at Apple's headquarters in Cupertino, California. The lab is now 20 times its original size when it was launched a decade ago. 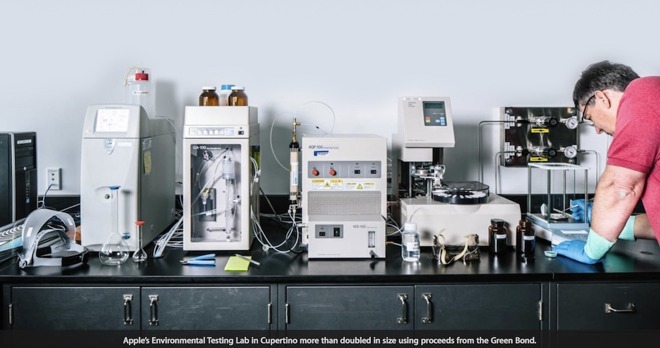 Apple's state-of-the-art Environmental Testing Lab, originally created in 2006, employs toxicologists and analytical chemists to rigorously examine the safety of materials used in the company's supply chain. The lab uses inductively coupled plasma mass spectrometry, X-ray fluorescence spectroscopy, laser-induced breakdown spectroscopy and ion or gas chromatography to identify any restricted materials that need to be eliminated. Green Bond funds were also used develop two tools facilitating the collection and analyzing of volumes of supplier data for the Full Material Disclosure initiative: a custom supplier web portal (for suppliers to provide material and chemical data) and a compliance engine (software used to manage and analyze the material and chemical data from suppliers). Originated in 2015, Apple's Full Material Disclosure program was designed to detail the chemical composition of every material used in 13,000 components included in the company's products, in order to determine possible effects to health and the environment. Identified toxins are reduced, removed, or replaced with new materials developed as safer alternatives. Among the hazardous materials Apple has eliminated from its products are arsenic, beryllium, brominated flame retardants, lead, mercury, PVC and phthalates. 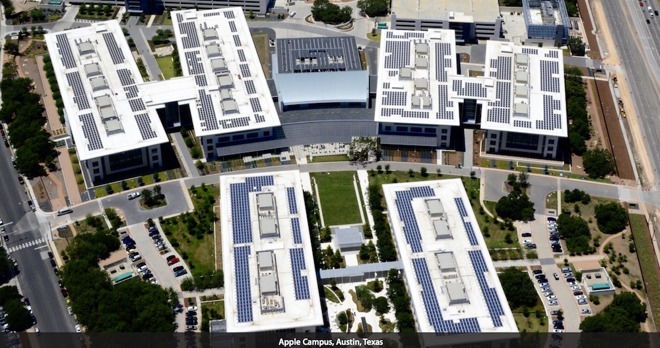 Green Bond funds were also allocated to a series of renewable energy and energy efficiency programs at the new Apple Park corporate facilities in Cupertino, California, formerly referred to as Campus 2. These include onsite renewable energy, battery storage, LED energy-efficient lighting designed to deliver 25 percent energy savings, and passive cooling features that take advantage of the dry, mild climate to reduce the building's cooling load by about 35 percent compared to conventional construction. The new campus is powered by 100 percent renewable energy from 4 megawatts of biogas fuel cells and a 16MW rooftop solar photovoltaic system that's among the largest onsite corporate solar energy installations in the world. Apple Park functions as its own power grid to enable continued operations even in a utility outage. The site has power controllers that enable it to operate autonomously, balancing energy supply (from solar, fuel cells, battery storage and backup generators) and energy consumption. In addition to the new Apple Park "Spaceship" campus, Apple also operates its original Infinite Loop headquarters along with over 100 other buildings spread around Silicon Valley, from Cupertino to Sunnyvale to San Jose. Green Bond funds were used over the last year to enhance the landscaping irrigation systems of these sites, including high-definition water flow sensors, irrigation submeters and irrigation controllers designed to accurately manage landscape-specific water use and respond to weather conditions. The irrigation monitoring and efficiency upgrades report real-time flow analysis and monitor leak detection down to extremely low flow rates. The systems shut off back flow automatically when a mainline break is detected. These upgrades in leak detection and programmed water delivery are expected to save up to 30 percent of the water used for irrigation: about 15.3 million gallons annually over 2015. 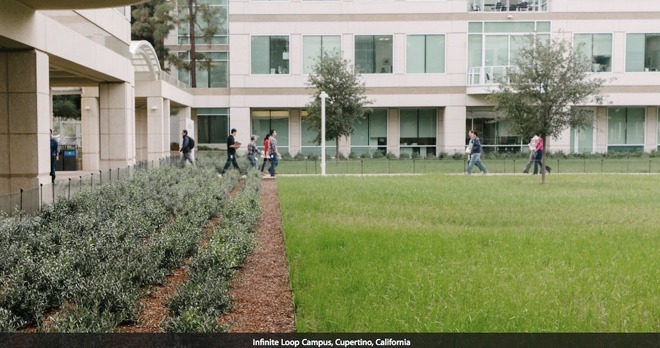 Over the past few years, Apple's Infinite Loop campus has systematically replaced decorative trees, grasses and other landscaping with native species that use less water. Apple's new 38-acre campus in Austin, Texas, is new enough that much of the site is still not yet visible on the company's own Flyover satellite maps. The site's 1.1 million square feet are spread across six office buildings that will hold 5,300 employees, a central conference room and cafe building and an adjacent central plant. The campus is designed to be certified by the U.S. Green Building Council as a Leadership in Energy and Environmental Design (LEED) Gold project, featuring LED lighting, high-efficiency water fixtures, water quality detention ponds and native drought-tolerant plants irrigated using a 600,000-gallon rainwater cistern. These environmental design features are expected to save over 6,692,000 kWh of energy and 4.3M gallons of water every year above the existing local building code requirements. The site also features a 1.4 MW rooftop solar installation designed to generate up to 1,959,900 kWh of renewable energy annually. Green Bond funds were also used to develop two renewable energy projects at Apple's iCloud data centers in Maiden, North Carolina, and Mesa, Arizona, continuing the company's use of 100 percent renewable energy across all of its data centers since 2015. The company's first major data center, located in North Carolina, has been powered by 100 percent renewable energy since it opened in 2010. The site's original 40MW solar array and 10MW biogas fuel cells have been expanded using Green Bonds to fund an additional 17.5 MW solar array built in Claremont, North Carolina. The new solar array will generate up to 39,500,000 kWh, equivalent to powering more than 2900 homes for a year. Its use will avoid over 18,000 metric tons of carbon dioxide emissions each year compared to using conventional energy plants. Apple's new data center in Mesa, Arizona, built in a facility originally designed to produce sapphire before the supplier collapsed in bankruptcy, will use Green Bond to fund a "utility-scale" 50MW solar array in Florence, Arizona. It will provide up to 151,000,000 kWh hours of electricity for the site annually, compatible to the annual energy use of 12,000 homes. The solar facility is expected to keep nearly 80,000 metric tons of carbon dioxide out of the atmosphere each year.